I first studied yoga in high school but drifted away. In 1999, I started to practice again and I fell in love with yoga. It has kept me physically strong and flexible, but more importantly I am much calmer, more centered. I guess you could say mentally strong and flexible! That’s the amazing thing about yoga—you start because you want to achieve some physical goal, but then something happens. You notice that you deal with stress better, you are less angry, more open minded. After 10 years of steady practice, it was time to share what I was learning. While I will always be a student, I was ready to teach. I studied the art of teaching yoga with the amazing Marni Task, earning my certification in February of 2010. Now I’ve fallen in love with teaching! What are my classes like? I teach for all abilities, offering modifications for newer students and opportunities to go deep for the more experienced. I believe it is important for my students to examine and understand how their bodies work, so there is a strong element of experiential anatomy and functional movement to whatever type of class I am teaching. There will always be moving with the breath. There is centering, there is easy movement, there is some challenging movement. There is balancing and sometimes going upside down. My goal is to sequence each class intelligently taking each body through its range of motion and finding some new space. And there is always the bliss of savasana to close. The best part of teaching is seeing the look on the students’ faces when they come out of savasana. Being a bit of a geek, I continue to study and learn. Since completing my 200 Hour training, I have taken more than 650 additional hours of formal training mostly emphasizing anatomy and the therapeutic benefits of a yoga practice. I also continue a regular practice both at home and with Marni and other local teachers. I love to help people feel better with movement and yoga. A yoga teacher is a conduit, passing along the teachings they’ve received. I am blessed to have studied with some wonderful, skilled and giving teachers. Here’s a highlight list: I have completed a 100 hour Body Balance Yoga Therapy certification program with Jenny Otto. 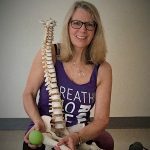 I am certified to teach Yoga Tune Up® and Roll Model Method® classes through the guidance of Sarah Court. I have also completed: 50 (+) hour Yoga as Therapy Training with Doug Keller; 30 hour Yin Yoga and Skeletal Anatomy Training with Paul and Suzee Grilley; 45 hours of Therapeutics and Restoratives with Judith Lasater; three amazing weekend workshops, a “teachers retreat” and an online sequencing training with my yoga teacher “crush” Jason Crandell; a weekend of exploring energy and movement with Arthur Kilmurray; Anatomy Trains for Movement Teachers with Carrie Gaynor and Holly Clemens; well over 100 hours of Anusara yoga with John Friend, Desiree Rumbaugh, Jamie and Justin Allison, Tiffany Fraser, Todd Norian, Mitchel Bleier (Anusara and post-Anusara), Sianna Sherman and, of course, Marni Task; and various workshops with Tiffany Cruikshank, Peggy Cappy, Baron Baptiste, Girish and Simon Park. I have also been privileged to practice with and learn from Tammy Schneider and Diana Vitantonio.